James MacMillan’s new choral piece, his Stabat Mater, was premiered in Norwich last October and while I don’t think Norwich’s was the very first performance it was almost the first. It was performed by The Sixteen and the Britten Sinfonia, both ensembles being ones that have forged a close relationship with MacMillan in the past decade or more. The performance was outstanding . . .
. . . but then so was the original music. I am writing about it here because not many masterpieces of music have their premiere in Norwich, yet this was one of them. It is in 4 parts: 1 Stabat mater dolorosa; 2 Quis non posset contristari; 3 Sancta Maria, istud agas; 4 Fac, ut portem Christi mortem. Each individual section has its own quality and the whole quartet contains its own dramatic progression from a plangent start to a quiet amen. The violins keen, the cellos growl and rumble, and the players slap their instruments with the bow. The violin melody is plaintive; but there are also stabbing chords like Bernard Herrmann’s music for Psycho. I thought too of the opening of Act 3 of Wagner’s ‘Tristan und Isolde’, with its powerful premonition of darkness, and of the pain articulated in Shostakovich’s string quartets. Praise too must go to the rhythms of the Latin, words that are plain, direct, and dignified. A month before the performance I had been in Bologna in Italy, and saw for the first time Niccolò Dell’ Arca’s ‘Lamentations’, a group of six sculpted figures gathered round the dead Christ (to be found in the sanctuary of the church of Santa Maria della Vita). This is in effect a visual version of the Stabat Mater, created in 1463. It is startlingly different from the normal perception of Mary’s pain in paintings of the crucifixion or the deposition, which paint tends to distance from the observer. Instead you are made starkly present. The route runs directly into our feelings via the emotions, not through our thought processes. As ever at performances of such religious choral music I am struck with puzzlement at what this subject, whether in sculpture or in music, must mean for a secular audience, or even a Protestant, non-Marian (anti-Marian even?) one. And yet it communicates something visceral. We live, I think, in a culture that responds more to feeling than fact, to emotion more than thought. That is why the Dell’ Arca sculpture has been rediscovered, as it were, and why a work like MacMillan’s Stabat Mater can burst through our secular carapace to an inmost response. James MacMillan was present at the concert in Norwich and with Harry Christophers, conductor of The Sixteen, talked to the audience about the work in advance of the performance. Memorable. Among the paintings in the current ‘Delacroix and the Rise of Modern Art’ exhibition at the National Gallery, is Van Gogh’s ‘Pietà’, included because Delacroix was an important painter for Van Gogh, and this particular painting is based on a Delacroix painting which Van Gogh only knew of as a monochrome print, so he reworked it as a vivid colour picture using lemon yellow and Prussian blue. Not only that, but he took the liberty of turning the face of the dead Christ into a self-portrait. In making his version of the gospel, Pasolini wanted to make as wide-ranging reference as possible to two millennia of Christian art. In this sequence he throws in the concept of the Stabat Mater and of the Romantic Agony. The NFGG paperback has just arrived, prior to publication. A good moment. But last night I saw Calvary and realized the book is already out of date. 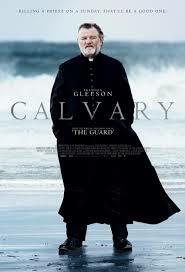 Calvary is about a priest in rural Ireland, the rock which waves of human sinfulness beat but cannot erode. It opens with a bald, shocking premise: in the confessional the good priest learns that he is to be killed in seven days’ time as atonement for the sexual abuse by a bad one that the anonymous confessor suffered as a boy. Its parentage is the French novelist, Georges Bernanos, filtered through Robert Bresson’s version of his Diary of a Country Priest and Maurice Pialat’s Under Satan’s Sun (compare Gleeson’s bulk under the soutane with Depardieu’s in that film). But it also nods – consciously or not I’ve no idea – to Winter Light (the fracture between priest and parishioners), I Confess (the secrecy of the confessional) and Léon Morin, Prêtre (the attractiveness of the priest to the woman). So, NFGG is out of date, already. A bad moment for me? Not really. It was bound to happen. Maybe I should start planning for THE RETURN OF THE NEW FILMGOER’S GUIDE TO GOD in a decade’s time. 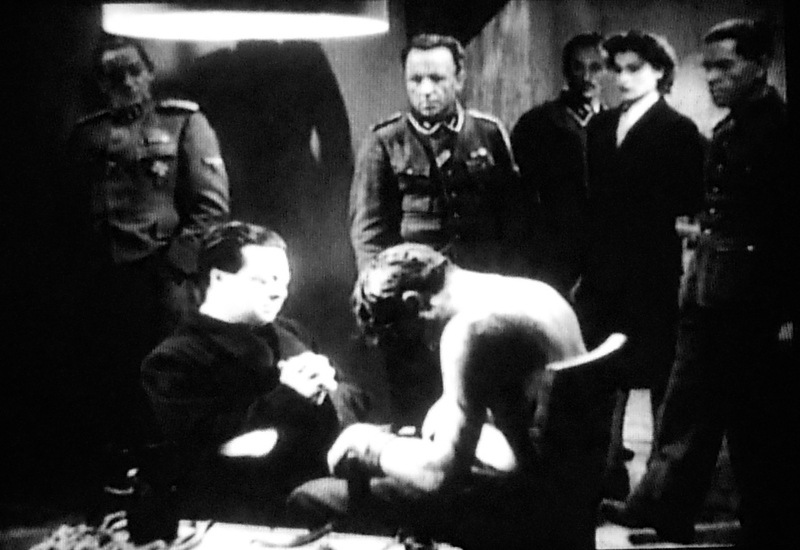 Rome Open City is a central film to ‘The New Filmgoer’s Guide to God’. The other day I saw it in the cinema in a new digital restoration, and was yet again transfixed. It is partly because Good Friday approaches, and while the film is a compelling story on its own it is at a deeper level the story of Rome’s crucifixion, or Rome’s Passion if you like. I expand on this in the book, and adumbrate the links the film has with Puccini’s opera ‘Tosca’, which help to give the film a greater resonance, since the operatic echoes deepen the sense in which Rome Open City is a quintessentially Italian film. Other countries suffered terribly in the war, but this was the uniquely Italian version of that suffering. This is a story that never fails to reach some inner core in me. I first saw the film at the age of 19, and have had a lifetime’s experience of it.